Dr. Sasinee can be a picture-perfect dentist in many people’s dream. It is not only her sparkling and most pleasing appearance that can send her patients up to cloud nine. But her academic qualifications and extensive work experience can also be more than reassuring. In 2006, she earned a Doctor of Dental Surgery degree (DDS.) from the Faculty of Dentistry, Prince of Songkla University in Southern Thailand. Next, she served as a general dentist respectively at Satul Hospital, Satul province, and Vachira Phuket Hospital, Phuket province –both are government hospitals in Southern Thailand– until 2008. 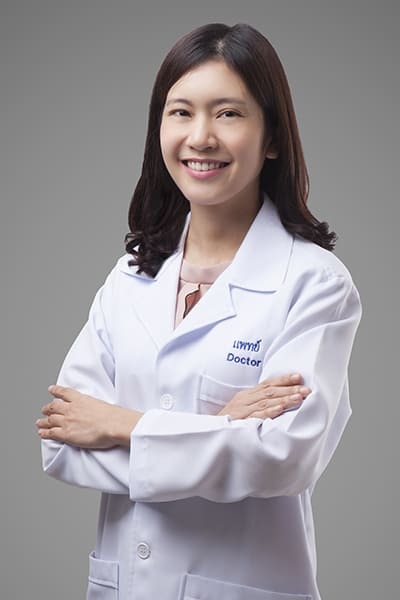 Finding that root canal therapy is her major interest, she pursued advanced studies and snatched a Graduate Diploma of Clinical Dentistry (Endodontology) from Srinakharinwirot University, Thailand in 2009. He career as an endodontist has begun in earnest ever since at the Bangkok-Phuket Dental Center, from 2009 until present. Her clinical focus includes root canal therapy, endodontic surgery, traumatic tooth treatment, emergency tooth pain, pulp revascularization, repairing a failure of root canal treatment, non odontogenic facial pain. She is currently a member in the Endodontic Society of Thailand.